The only loser on election night was North Dakota, where a recreational marijuana ballot measure fell short. 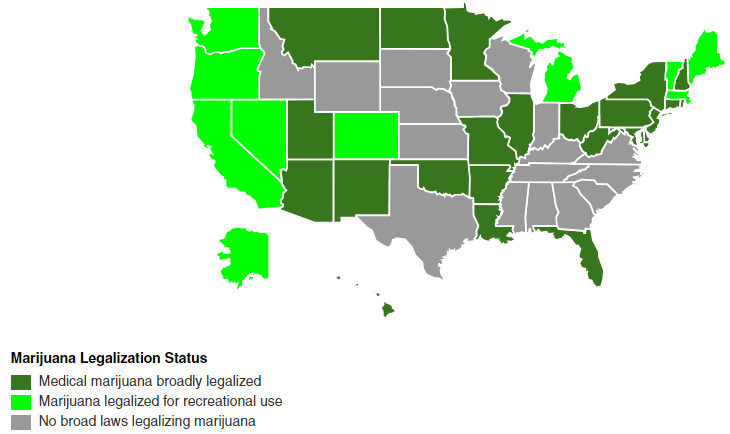 Every state that has legalized recreational marijuana first legalized it in a medical capacity, and medical marijuana ballot measures are considered a “gateway” to recreational ones. That makes perfect sense, according to Alison Holcomb, the primary drafter of Washington State’s recreational marijuana initiative. It also makes sense logistically, Holcomb said. When states legalize medical marijuana, it gives their agencies, such as the departments of health and agriculture, opportunities to tinker with their systems until they become available to a wider swath of people. It also gives constituents time to get used to what, for many, was a frightening prospect, said Holcomb. In states that have legalized marijuana for recreational use, sales have brought in much-needed revenue to help study its effects. In Colorado, for example, recreational cannabis sales topped $1 billion in 2016. Marijuana ballot measures also seem to have the unique ability of getting traditional non-voters to the polls, according to Sam D’Arcangelo, director of the Cannabis Voter Project. While marijuana advocates are celebrating double wins, it is becoming clear that federal laws are outdated, leaving states with a patchwork of confusing and inconsistent ones. In June 2017, Mexico beat the United States to legalizing medical marijuana nationwide, but not everyone celebrated the landmark decree: Under the law, only products containing less than 1% THC are permitted.